It's always a colorful party when we introduce an issue of dsm magazine. Be among the first learn about this image from our new issue. Of course you're free to do something else this evening, but why would you want to? The March/April issue of dsm magazine will make its debut amid a fun celebration from 5 to 7 p.m. today (Feb. 27). We'll reveal the cover, pass out copies, and celebrate our hosts at 6 p.m. The hosts for this issue are the folks at Anawim Housing, 1171 Seventh St., Suite 1, where they have been dedicated to providing affordable housing and family services to tenants for 30 years. Expect to find appetizers, beverages, the dsm team and other new friends there later today. It was a night of firsts at the fourth annual Thrivent Financial Iron Somm. Saturday night’s event was the first time the competing sommeliers were both women: Kelsey Seay of Best Case Wines and Blair Zachariasen, wine pro at Fourth + Court Hy-Vee. It was also the first year that the defending champion held the title—Seay, who took the honor last year, won this year’s close match. A standout dish of the evening was Centro chef Derek Eidson’s study in duck, with foie gras, roasted duck breast, duck leg crepinette and duck bacon (that final touch had people clapping and cheering the chef as the recap of the evening’s food was announced). • David Baruthio has been named a Maître Cuisinier (Master Chef) from the Maître Cuisiniers de France organization. The title goes to French citizens who uphold high standards for French cuisine, regardless of where they are cooking in the world. This is not a crowd-sourced honorific: Master chefs within the organization choose the new inductees. Baruthio joins the ranks of fellow Frenchmen Daniel Boulud, of New York City’s acclaimed Daniel restaurant, and Sylvain Delpique of that city’s famed 21 Club. See Baruthio’s listing here. • Christina Moffatt, owner of Crème Cupcake and the director of Small Business Development at the Greater Des Moines Partnership, is the first recipient of the Ivy Women of Business Inspiration Award by Iowa State University. The award recognizes women dedicated to encouraging other women along the path to success. As a food journalist, I have often been impressed by the way Moffatt often shines the spotlight on her staff (rather than herself) at Crème. As an example, when asked to offer up a recipe for our magazine, Moffatt insisted that pastry chef Holly Evans be the featured pro in this story for dsm magazine. A portion of the photographic image "Pull," created in 2013 by artist Mary Mattingly, who will speak at the Art Center on April 12. How do you document a trip? If you’re like most people, you take a few snapshots or keep a journal. Maybe you post videos on Facebook. But artists do things differently. In the new show at the Des Moines Art Center, called "Wanderlust," you can see all sorts of souvenirs from trips artists have taken, including a shopping-cart-size bundle of stuff Mary Mattingly dragged across a New Jersey bridge, more than 1,200 porcelain replicas of junk Marie Lorenz pulled from the Erie Canal, and – my personal favorite – photos of bugs that spattered across Greg Stimac’s windshield during road trips along the Pacific Coast Highway and Route 66. The exhibition itself is a traveler, having originated last year at the University of Buffalo, and it explores how three dozen prominent artists have ventured outside their studios over the past 50 years to create artwork. There are 10 videos on display, including five in their own dimly lit viewing rooms, plus dozens of photos, a poem and a couple of sculptures. Some of the pieces happen to be beautiful, but most were created as records of an experience rather than as aesthetic objects. So pace yourself, dear visitor: Your brain will work harder than your eyes. "There’s a lot of detective work here," University of Buffalo Art Galleries curator Rachel Adams said during the installation. Sometimes you have to look for clues to figure out exactly what was going on. Consider the British artist Richard Long’s 1967 black-and-white photo "A Line Made by Walking," which shows a straight path he trampled in a grassy meadow. It’s not much to look at, but it raises questions about the directions our lives can take and the traces we leave behind. In a 2001 video called "The Great White Way," the African-American artist Pope.L dons a Superman costume, minus the cape, and alligator-crawls all 22 miles up Broadway, from Manhattan’s southern tip all the way past Washington Heights. The camera catches the mixed reactions of passers-by – curious, troubled, indifferent. In January a blind artist named Carmen Papalia called Art Center curator Jared Ledesma and asked him to walk through the museum and describe into an audio-recorder exactly what he saw. From the recording, Papalia wrote a poem and printed copies on big sheets of paper, which visitors are free to take. The exhibition is big and varied enough that you’ll probably find some things that you like and some you don’t. With such conceptual artwork, a lot depends on the written descriptions that are posted near each piece and tend to be a bit dense. One video is described as "simultaneously beautiful and terrifying, mundane and extraordinary, simple and complex, exhilarating and numbing." Another video, shot from a canoe, resembles "a dérive, in the Debordian sense, [and] is then the river’s own psycho-geography, cataloging time through subtle and unexpected encounters with the terrain." OK, sure. But I still prefer the windshield bugs, partly because their description is so poetic. "Constellations of tiny bodies broken on glass" put "the human experience in perspective: a thousand lives lost for a road trip at night, a car rushing through the air, as others have done and will do, under an infinite sky." If anything, the show suggests that any trip can be meaningful if we take it intentionally and pay attention, whether it’s to the grocery store or another country. Just step outside. "Wanderlust" remains through May 13 at the Des Moines Art Center, 4700 Grand Ave., with an array of related programs, including a gallery talk with curator Laura Burkhalter on March 8, two performance-art tours through the downtown skywalks with artist Todd Shalom on March 22 and 23, and a lecture by artist Mary Mattingly on April 12. Find details and register at desmoinesartcenter.org. Charles Schulz's pal Linus Von Pelt has been waiting more than 50 years. Des Moines gets its own "great pumpkin" today. The bronze sculpture is shown at right. An 8-foot-tall bronze pumpkin finds a home in the John and Mary Poppajohn Sculpture Park today. The pumpkin theme and dotted surface are signatures of pioneering contemporary artist Yayoi Kusama, 88. Titled "Pumpkin Large," it will be planted on the Grand Avenue side of the park. The pumpkin was cast in London and lost none of its freshness in transit to Des Moines. 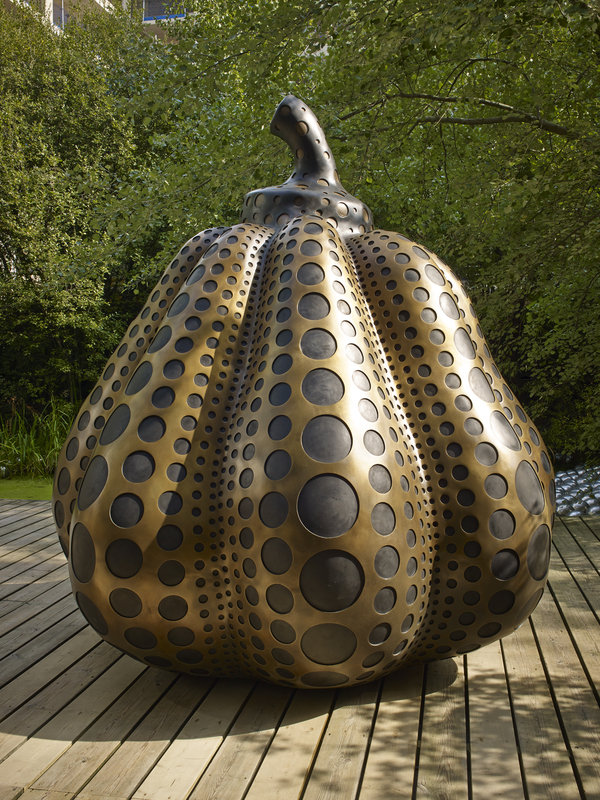 Pumpkins are a recurring theme for Kusama, who grew up in Japan, where her family owned a seed nursery. The colors and flair of America's desert southwest come to vibrant life in a modern dance production Saturday. One of the interesting aspects of the annual Dance Series produced by Des Moines Performing Arts is the opportunity to hear directly from members of the dance companies both before and after each performance. Enjoy that experience Saturday, March 3, when the dance company Momix performs at 7:30 p.m. in the Des Moines Civic Center. Choreographer Moses Pendleton brings the landscape of the American Southwest to life with his signature illusionistic style, creating dynamic images of cactuses, slithering lizards and fire dancers. Tickets are $15 to $60 and can be purchased here, where you can also find additional information about the production. The Pre-Show Dance Talk begins at 6:30 p.m., which will feature a member of the company's artistic staff for a 30-minute chat that will include time for audience questions. The Post-Show Dance Talk, immediately after the performance, offers an opportunity to ask questions of the dancers. The musical lark "Mama Mia!" will kick off the 100th season at Des Moines Community Playhouse this summer. Des Moines Community Playhouse has announced what it describes as "the most celebrating, eye-popping, song-singing, 100-year-loving, big-doings season ever." Well, we say, if you're going to make an announcement, go big. (After all, look how we carry on about our own public events.) The theater's 100th season includes six musicals, plus drama, comedy and family shows. Bravo! Shows this year include "Mamma Mia!" July 13-28; "Billy Elliot" Oct. 5-28; "The Best Christmas Pageant Ever" Nov. 2-25; and "Elf—The Musical" Nov. 30-Dec. 23. But wait, there's more! Another seven shows are slated in 2019. Playhouse season tickets (and tickets to "Mamma Mia!") go on sale April 3 online at dmplayhouse.com and at the Playhouse ticket office. Kesha appears to be looking ahead to performing at the 80/35 festival in Des Moines July 6 and 7. This just in: Pop star Kesha and indie duo Phantogram will headline the 80/35 music festival, which returns July 6 and 7 in downtown Des Moines’ Western Gateway Park. More than 50 acts will perform at 80/35. For more on the festival and bands, click here. Explore other entertainment options with a pair of easy-to-use online calendars. We at dsm magazine and the Business Record maintain this calendar with handy filters so you can see just the types of events you're searching for. For even more categories, check Catch Des Moines.